This tutorial shows you two ways of configuring your PHP development environment on the Windows operating system. The first and most convenient way is to install and configure an AMP (Apache, MySQL, PHP) package. This tutorial shows you how to install the XAMPP package. The second way is to install and configure each component separately. Version 5. Included in XAMPP-Windows. Apache HTTP Server 2.2 is recommended. Included in XAMPP Windows. MySQL Server 5.0 is recommended. Included in XAMPP Windows. Typically, development and debugging is performed on a local web server, while the production environment is located on a remote web server. Setting up a remote web server is described in + Deploying a PHP Application on a Remote Web Server Using the NetBeans IDE+. This tutorial has you set up a local web server. PHP support can be added to a number of local web servers (IIS, Xitami, and so on), but most commonly Apache HTTP Server is used. Apache HTTP server is included in the XAMPP AMP package used in this tutorial. For information on installing and configuring Apache HTTP server standalone, click here. A web server. Typically development and debugging is performed on a local web server, while the production environment is located on a remote web server. The current version enables using a local server. Using a remote server with FTP access will be supported in future versions. PHP support can be added to a number of web servers (IIS, Xitami, and so on), but most commonly Apache HTTP Server is used. Click here for information on how to install and configure Apache 2.2. The PHP engine. The supported version is PHP5. Downloads are available here. The PHP debugger. The NetBeans IDE for PHP allows you to use XDebug, but using a debugger is optional. The recommended version is XDebug 2.0 or higher as it is compatible with PHP5. A database server. You can use various database servers while one of the most popular ones is the MySQL server. Downloads are available here. The recommended version of the product is MySQL Server 5.0. The provided documents describe the work with this version. After the installation, you need to set up the environment that all the software components work properly with each other. You can use a Package, that contains the required software, or install each component separately. To have all the configuration settings for the PHP engine, the Apache HTTP Server, and the MySQL database server specified automatically, use an AMP package. This tutorial gives instructions only for the XAMPP-Windows package. For help with the WAMP package, please see the NetBeans XDebug Wiki. The section describes how to download, install, and configure the XAMPP package. Do NOT use XAMPP 1.7.0. There are significant problems with XDebug in this version. Use version 1.7.1 or later, where these problems are fixed. Starting with XAMPP 1.7.2, XAMPP comes with PHP 5.3, not PHP 5.2.x. NetBeans IDE for PHP version 6.7.x does not support the new PHP 5.3 functions. NetBeans IDE for PHP 6.8, currently available as a development build, fully supports PHP 5.3. Also note that Xdebug installation differs between PHP 5.2.x and PHP 5.3. When the download is completed, run the .exe file. On Microsoft Vista, the User Access Control feature blocks the PHP installer from updating the Apache httpd configuration. Disable UAC while you are installing XAMPP. See Microsoft support for more information. You are given the option to install the Apache server and the MySQL database server as services. If you install the Apache Server and MySQL as services, you will not have to start them manually through the XAMP Control Panel. Note that you have the option to install or uninstall these services in the XAMPP Control Panel. After configuration, open the XAMP Control Panel. (You can open it manually by running the file XAMPP_HOME/xampp-control.exe or from the Xampp Control Panel icon that is automatically placed on your desktop.) When you open the XAMPP Control Panel, note that the modules that are installed as services are already running. On Windows Vista sometimes xampp-control.exe will not run. You can run xampp-start.exe instead. The winmysqladmin.exe file , which is launched by the Admin button for MySQL, does not work. A cascade of error messages appears, which can only be stopped by manually terminating the winmysqladmin process. You cannot launch winmysqladmin.exe from the command line, either. See http://bugs.xampp.org/view.php?id=71. The Svc checkboxes indicate that a module is installed as a Windows service and will start automatically on system startup. You can install or uninstall Windows services by selecting or unselecting the Svc checkbox. Uninstalling a Windows service does not uninstall the module, but it does require you to start the module manually. 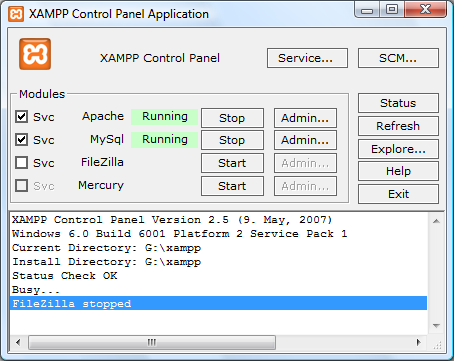 The XAMPP control panel includes buttons for stopping and starting modules and opening their administration consoles. To ensure that the Apache and MySQL servers have been installed as system services, restart your operating system, run the browser, and enter the http://localhost URL again. 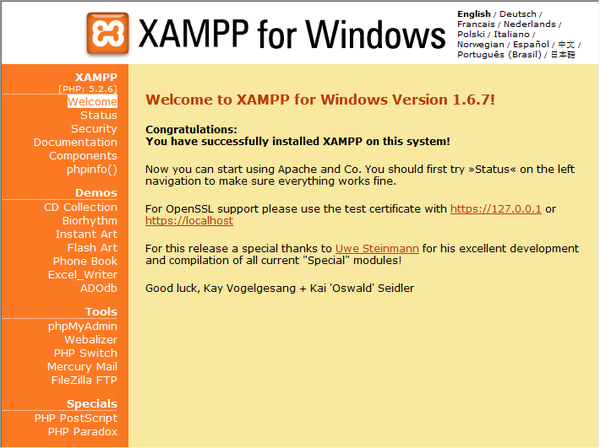 The XAMPP welcome page opens. Note that the XAMPP welcome page includes a menu in the left margin through which you can check the status of XAMPP components and run phpinfo() , among other useful features. 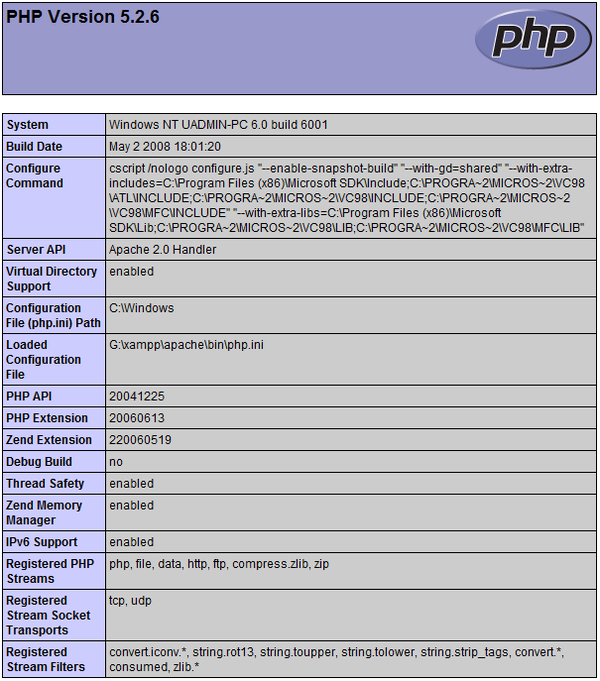 phpinfo() returns a screen with configuration information about your XAMPP components. You need to configure your PHP stack to use XDebug. The process differs if you are using XAMPP 1.7.1, which bundles PHP 5.2.6, or XAMPP 1.7.2, which bundles PHP 5.3. Many users have experienced difficulties in getting XDebug to work on their systems. Please see our wiki and the NetBeans PHP Editor Users' Forum for assistance. You must download XDebug, place the .dll file in your php extensions directory, and configure php.ini to find and use this file. Locate and open the active php.ini file for your XAMPP. This is located by default in the XAMPP_HOME/apache/bin directory. Confirm which php.ini file is active by running phpinfo() and searching for Loaded Configuration File. To attach XDebug to the PHP engine, uncomment the following lines in the php.ini files (directly beneath the [Zend] section, add them if not there). Some additional notes have been added. ; Port number must match debugger port number in NetBeans IDE Tools > Options > PHPxdebug.remote_handler=dbgpxdebug.profiler_enable=1xdebug.profiler_output_dir="<XAMPP_HOME>\tmp"
Set the xdebug.remote_enable property to 1, not "true" or any other value. Make sure the paths you specify match the location of the corresponding files as determined during your installation. Run the XAMPP Control Panel Application and restart the Apache server. See our wiki and the XDebug documentation for more information on how to configure XDebug. XAMPP 1.7.2 comes bundled with the appropriate Xdebug .dll file. You only have to configure php.ini to use it. Note that all Xdebug settings have text explaining them. Locate and open XAMPP_HOME\php\php.ini for editing. This is the only php.ini file in XAMPP 1.7.2. Find and uncomment the line zend_extension = "XAMPP_HOME\php\ext\php_xdebug.dll" . Find and uncomment the line xdebug.remote_host=localhost . Change the value of the setting from localhost to 127.0.0.1 . Find and uncomment the line xdebug.remote_enable = 0 . Change 0 to 1. Find and uncomment the line xdebug.remote_handler = "dbgp" . Find and uncomment the line xdebug.remote_port = 9000 . Run the XAMPP Control Panel Application and restart the Apache server. See our wiki and the XDebug documentation for more information on how to configure XDebug. Download the Apache2 HTTP server. Run the installation file .msi . The installation wizard starts. Follow the instructions. On Microsoft Vista, do not install the Apache Server to the default location, which is in Program Files. All files in Program Files are write-protected. When the installation is completed, restart the Apache server. Locate the line Listen 80 and change the port number, for example 8080 . Save the file. Restart the Apache web server. You can also stop the processes that possibly listen to port 80. In the Task Manager, select the relevant file name and click End Process. Find more information on installing and configuring the server here. Download the Windows binary installer for the PHP5 version of your choice. If there is no installer available for the version of PHP you want to install, you have to install it manually from the .zip file. See Manual Instruction Steps in the php.net documentation. When the download is complete, run the .msi installation file. The installation wizard starts. On the Apache Configuration Directory panel, specify the directory where the httpd.conf file is located, the default setting is C:\Program Files\Apache Software Foundation\Apache<version>\conf\ . The PHP processing will be enabled automatically. If you want to use the MySQL database server, choose the Complete installation option or select the MySQL and MySQLi items in the Extensions list. After the installation is completed, restart the Apache server. If the lines are missing, add them, save httpd.conf , and restart Apache. Find detailed information on installing and configuring the MySQL database server. Install XDebug into the php/ folder. You will need the path to it to configure your environment. If your installation follows the default settings, PHP processing will be enabled automatically. zend_extension_ts="<path to the php folder>/php_xdebug-<version-number>.dll"
zend_extension_nts="<path to the php folder>/php_xdebug-<version-number>.dll"
zend_extension="<path to the php folder>/php_xdebug-<version-number>.dll"
Click here for more information on how to configure XDebug. Make sure the paths you specify match the names and locations of the corresponding files as determined during your installation. On the Control Panel, choose Add or Remove Programs. On the Add or Remove Programs panel, select the PHP <version number> area and click Change. The PHP Setup Wizard starts. Click Next. On the Change, repair or remove installation panel, choose Change and click Next. On the Web Server Setup panel, choose the version of the Apache server - in our example it is Apache 2.2.x Module. Click Next. On the Apache Configuration Directory panel, specify the directory where the Apache configuration file httpd.conf is located. Click Next. On the Choose Items to Install panel, expand the Extensions node and choose the MySQL and MySQLi items. Click Next. On the Ready to change PHP <version number> panel, click Change. On the Completed the PHP <version number> Setup Wizard panel, click Finish.